I don't want to confuse you, but Gorgonians are at least slightly different. 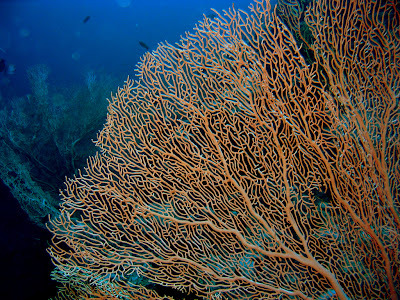 They are a kind of coral and are also known as Sea Fans or Sea Whips due to their shape. The Fans branch out extensively such that they're almost one, big surface. They can get pretty tall and wide but typically remain extremely thin. There are some that are a little more bushy, but a lot of them are almost 2 dimensional. More like a really complicated leaf. They don't look particularly "dreadful". In fact, they can look incredibly beautiful. Unless of course you use your imagination and think of it as an angiogram of a giant lung. Just a 2 metre long lung growing out of a wall. I guess if the land has rainforests it's reasonable for the sea to have its own lungs, too. From what I can see, the Sea Whips tend to be more cat o' nine tails style than the single lash type. 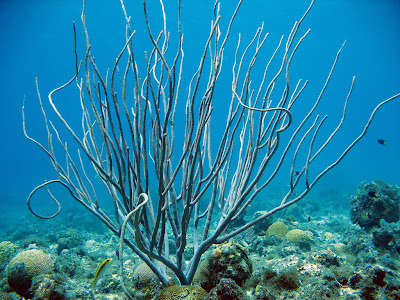 Some of them are known as Sea Rods and some look more like birch rods. It's corporal punishment GALORE! Dreadful for some people, others not so much... What's the Greek for "naughty"? Gorgonians used to be in the order Gorgonacea, back when life was simple and loaves of bread were delivered to you by a boy on a bicycle and you could whip him to tears if he was more than 30 minutes late. Aahhh.... the good ol' days. These days, Gorgonians are members of several suborders in the order Alcyonacea and it's all disputed and ambiguous and up in the air. Still, Alcyonacea are the soft corals. 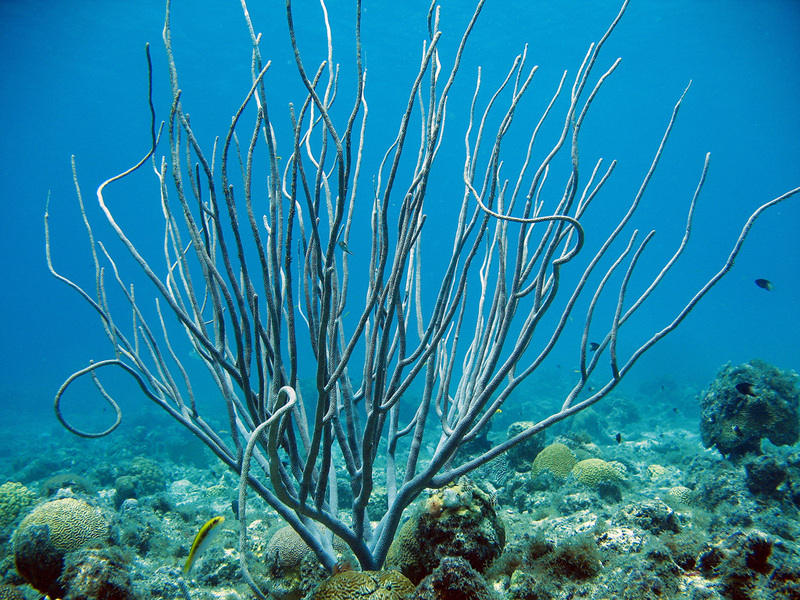 They don't produce the kind of solid, calcium carbonate skeletons that the stony corals do. 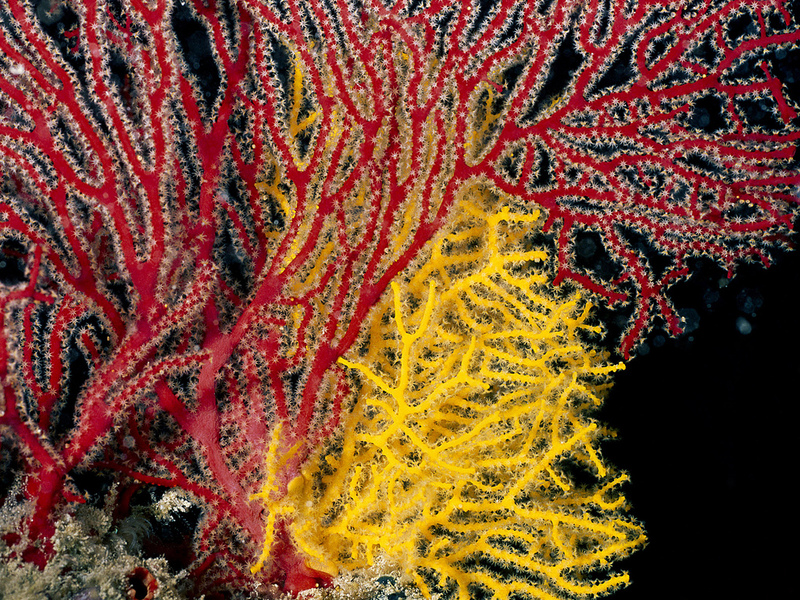 Gorgonians are much more flexible than stony corals. 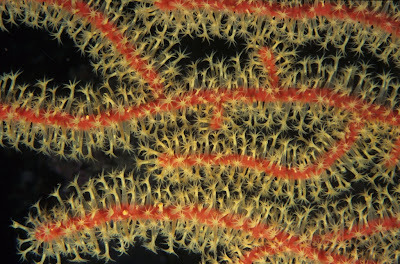 Some have tiny calcium carbonate pieces called sclerites, some produce their very own protein called gorgonin and others use both. 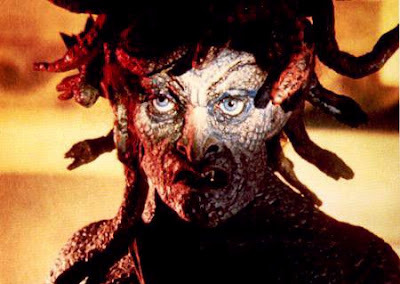 I don't think those Greek Gorgon monsters knew enough chemistry to make their own proteins. Turn a guy into stone, though. Swings and roundabouts, I suppose. This flexible skeleton allows Gorgonians to wave to and fro in currents and water turbulence. This is valuable when you're standing so tall in the ocean, you don't want the slightest motion to snap you in half. No, you need to go with the flow. It's all very Zen and Tao and all that stuff. 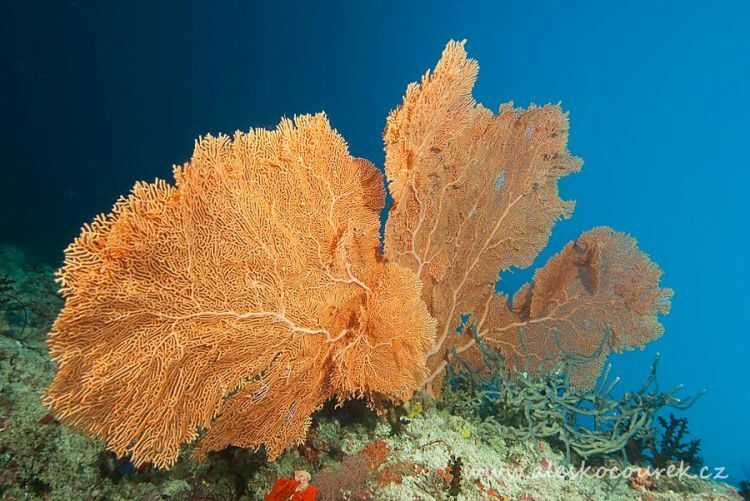 Perhaps our Gorgonian is not "forceful" at all? On the other hand... Jedi! Those guys had Force coming out their ears! Actually Gorgonians are very forceful when it comes to insisting things become their food. These are Cnidarians, so they feed on tiny members of the travelling plankton community. Sea Fans grow right across the current so they take the full brunt of the flow and everything that rides on it. 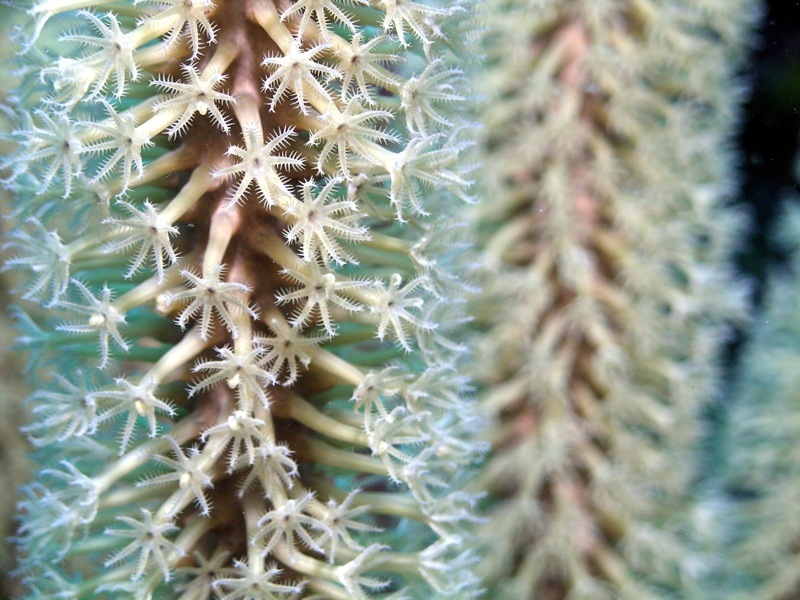 When all is well, polyps emerge from that flexible skeleton to try out their stinging cells on whatever creatures are miniscule enough to eat. Gorgonians are a kind of Octocoral, so each polyp has 8 tentacles. 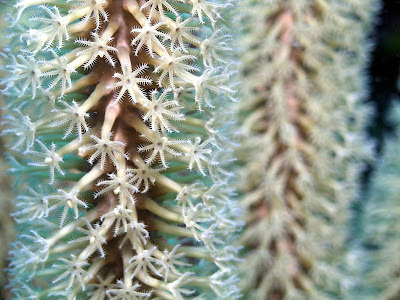 And each tentacle has numerous little branches on either side. Utterly delightful! When it's not eating you. 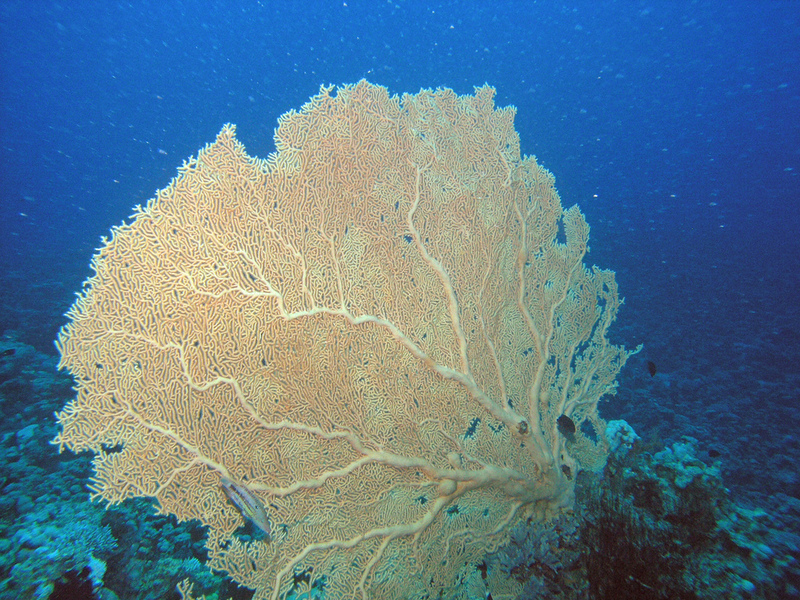 Some Gorgonians also have algae lodgers within their tissues, which is not uncommon in Cnidaria. 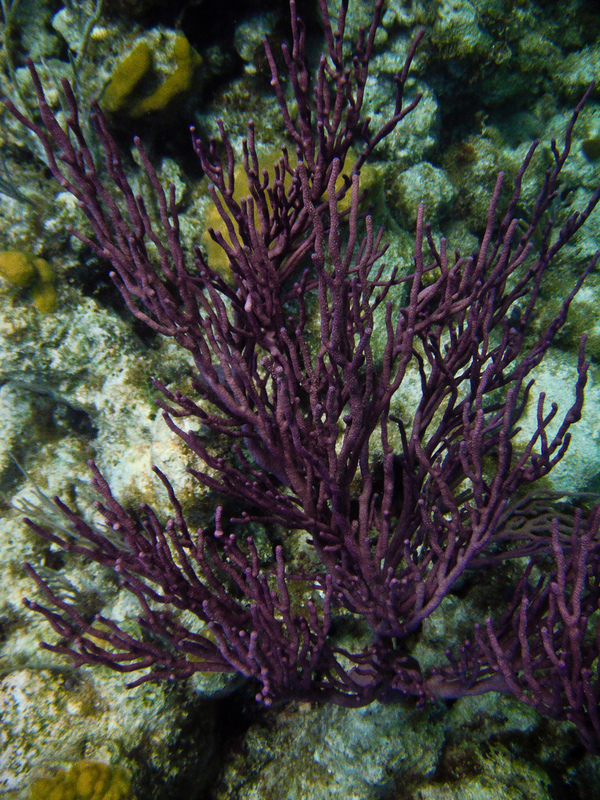 The algae get energy from the sun and share it with the coral, in return they are protected from harm and have somewhere bright and cosy to stay. 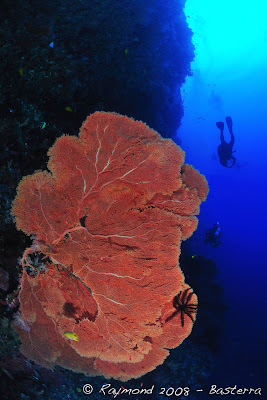 So that's one example of a "guardian" Gorgonian for you! What about "far roaming"? 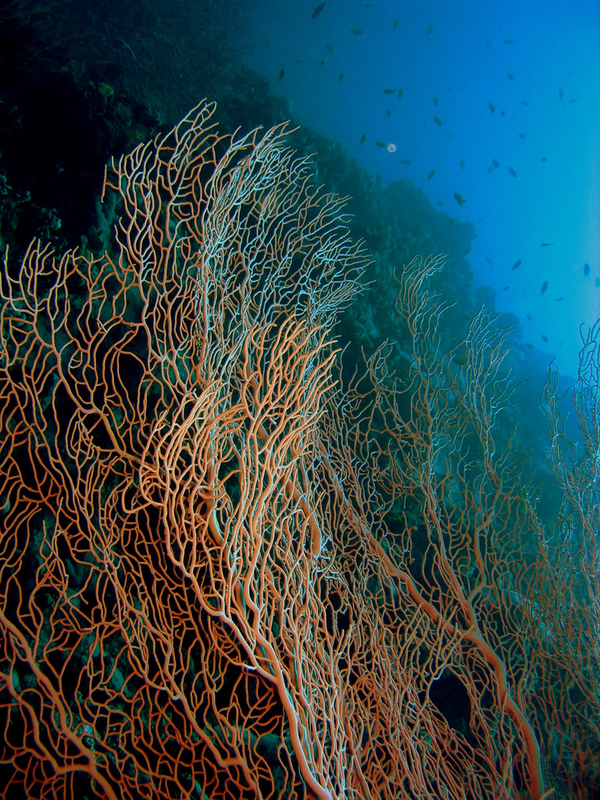 Gorgonians are most abundant in the Caribbean, but they are also found in other tropical and temperate parts of the world as well as in the deep sea. Sometimes the flexibility of Gorgonians is not enough and they get broken up by hurricanes and the like. Despite the terrible devastation, a lot of Gorgonians can take such events in their stride. 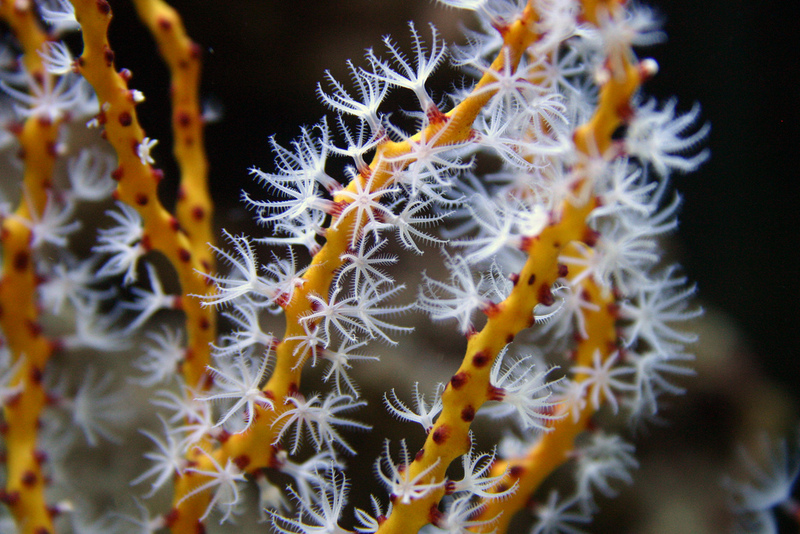 A tiny piece of Gorgonian can grow into a whole new Gorgonian colony! It's like those trees that have seeds that only begin to grow after a terrible fire. Again, just go with the flow, man! 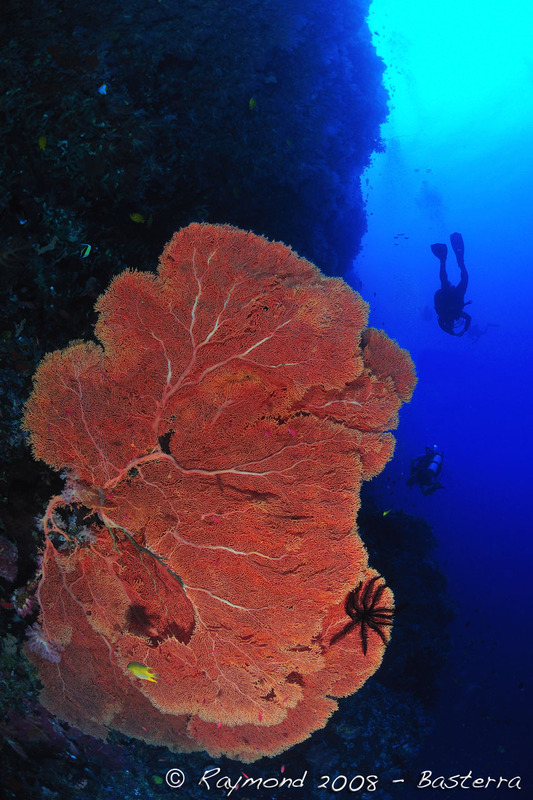 And it means that even a single Gorgonian can be far roaming! 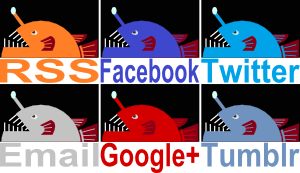 The usual reproduction method is with eggs and sperm. Some Gorgonians throw them both out and let them get on with it. Others retain the eggs and capture the sperm from the sea. Either way, the eggs develop into the kind of planula larvae we saw in the Jellyfish Lifecycle. These swim and drift and drift and swim until they find a surface to live on. It will become the first polyp and begin budding new, identical colonists. So that's the main thing that Gorgonians guard; lots and lots of eggs for the next generation. Almost all of them will get eaten by something or other, but a precious few will grow into the beautiful and wondrous Gorgonians of the future. Whatever Medusa was guarding, it seems they weren't lots of baby Medusas. Good! Haha! I have to agree. 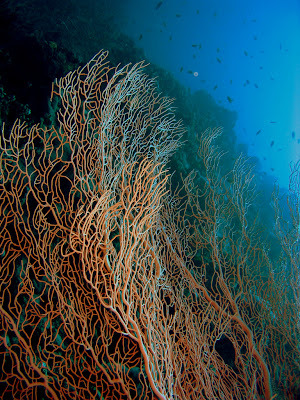 I'd certainly give the Gorgonian a much closer inpection than I would that ugly mug!